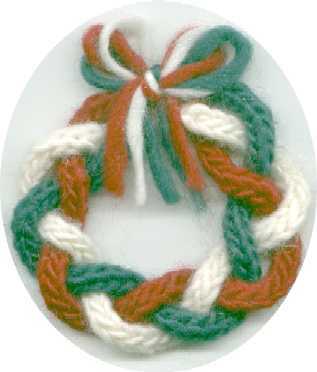 Materials - Small amounts of red, green and white worsted weight yarn. Needles - A pair of size #7 US (4.5 mm) double pointed needles. Make three 8" long pieces of I-cord, one in each color, leaving at least a 6" tail of yarn hanging from both ends of I-cord. Without turning, slide the stitches to the other end of the needle, put the needle in your other hand, pull the yarn firmly across the back. You are ready to knit the next row. Continue knitting, sliding, and pulling the yarn across the back until I-cord is desired length. Braid the three strands of I-cord, then tie into a circle using the loose ends of yarn. Knot firmly, then tie into a bow. Trim ends of yarn. Add a hook or loop for hanging. Makes a wreath about 3" in diameter.